Poor old Northampton. Their cricket team is currently languishing second from bottom at the foot of the lowest English division. Their football team are an equally disparate bunch, narrowly missing relegation from the football League One last season into the financial Pit of Sarlacc that is League Two. However, aside from its current lacklustre representation in the world of sports, Northampton still represents the pinnacle of footwear manufacturing and style, with over 100 years’ of heritage no less. The plentiful supply of oak bark and water for tanning, an abundant supply of leather from local cattle markets, and a central location for trading links quickly made Northamptonshire the ideal place for shoemaking to flourish, and in turn saw around 2,000 individual manufacturers working there near the end of the 19th century. Although there are a lot fewer factories still operating today within the area, demand for English-made shoes remains high, with the British Footwear Association reporting sales increased 30% from 2010 to 2014. It seems traditional shoemaking remains impervious to the threat of automation that seems to be crippling many other sectors in the textiles industry. Which makes sense – after all, how would an R2 unit be able to replicate the 200 different hand operations needed to make a pair of Goodyear-welted shoes? How would any machine be able to synthesise the knowledge and individuality of 160 skilled craftsmen and women – some of whom are fifth-generation employees – who are integral to the production process? Although many of the finest English shoes are still manufactured in and around Northampton, the capital also lays claim to truly exceptional footwear. ‘Outsiders’ such as George Cleverley design and produce traditionally-made shoes entirely in London, while there are a number of ‘British Designed’ brands like Oliver Sweeney which conceptualise their wares within the UK but outsource production to other renowned footwear making countries such as Italy and Portugal to keep production costs down. On the topic of ‘British Made’, Grenson is continuously harangued for its misleading branding. 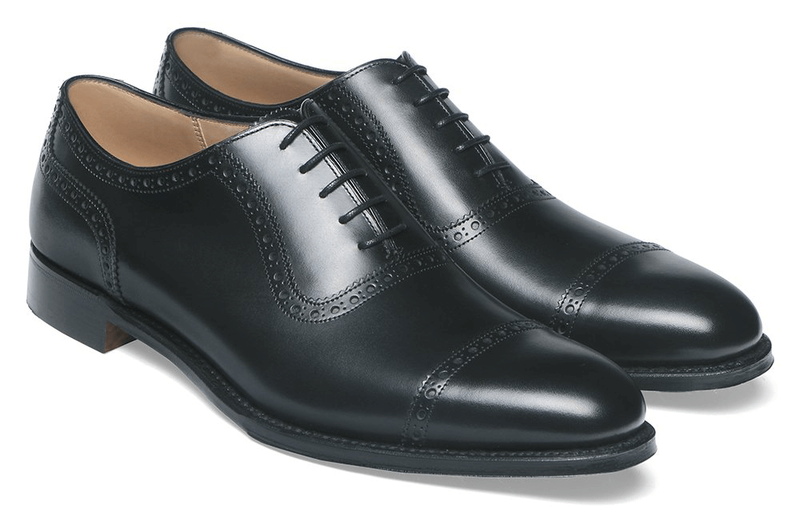 To explain, Grenson’s G:One and G:Zero collections are made entirely in Northampton – ‘skin to box’, as the phrase goes. Yet the brand’s G:Two line is actually made in India. The design, pattern-making and most of the leather sourcing is done at the brand’s Northamptonshire base, but then it’s sent to a Goodyear-welting factory in India for manufacturing. Some might say call it disingenuous having British Made on all the packaging, but to their credit, it’s thoroughly annotated on their website and is designed to make high-quality footwear more affordable for the masses. 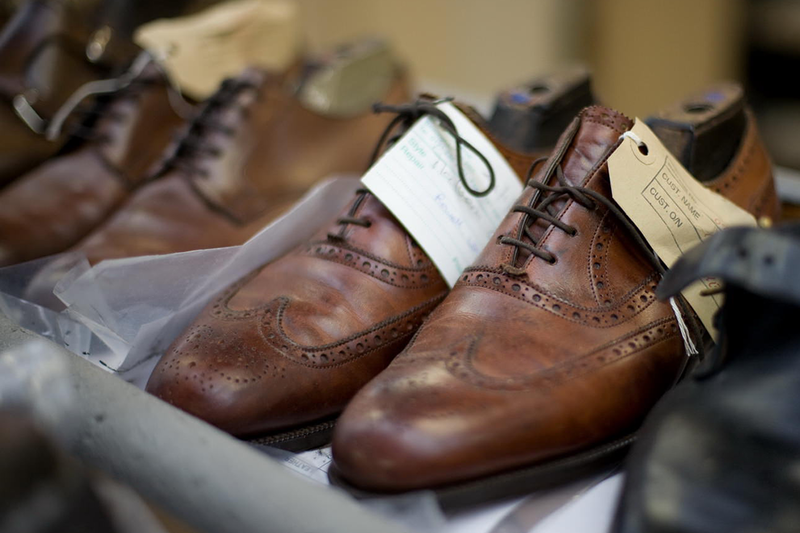 Founded in 1880, Barker shoes have been an English tradition for over 135 years. The company uses only carefully selected leathers, while the uppers are shaped by hand on the lasts. Today, Barker remain true to traditional manufacturing methods, including slow natural dying and polishing, and its footwear is still made in the same in the Northamptonshire village of Earls Barton (as well as some in India). Cheaney was established by Joseph Cheaney in 1886, and in 1896, along with his brother Arthur, they moved to the site which the factory still occupies today. Originally Cheaney made white label shoes exclusively for some of the finest retailers around the world, each adapted to their individual company requirements. But it was Joseph Humphrey Cheaney, the founder’s grandson, who recognised the company needed to produce their own-brand shoes. In 1964 Cheaney was sold to Church’s English Shoes, which meant the brand then became available to retailers all over the world, backed by a comprehensive in-stock service from the Desborough factory. And in 2009 Jonathan and William Church bought the company – themselves descendants of a family who has been making high-quality shoes for five generations. Crucially, they continue to be fully committed to producing the finest footwear entirely made in England. Church’s was founded in 1873 by Thomas Church and his three sons. During the 1990s the brand fell under the control of Prada, who bought an 83% in the company at $170 million. Prada later sold a 45% stake to Equinox, a private equity firm. The company factory remains in the St James area of Northampton, and has an estimated production capacity of 5,000 pairs per week. The levels of quality established in 1873 remain today, and all shoes are 100% made in Northampton. Founded in 1879, Crockett & Jones has produced some of the world’s finest footwear from their factory in Northampton. And incredibly, to this day, the business is owned and managed by the founding family, who have remained true to its quality and timeless style above all else ethos. All shoes are 100% made in Northampton. They are perhaps Ape’s favourite footwear brand. One of the most costly brands in this list but Edward Green shoes justify their price tag due to being cut by hand from the world’s finest leathers. Each pair is made in the brand’s Northampton workshop according to the same principles whih have guided the brand since 1890. Crafted and honed with unerring attention to detail, each pair of shoes embody the timeless elegance of the quintessentially English style favoured by the likes of Ernest Hemingway and the Duke of Windsor. George Cleverley was born on the 10th of August 1898 into a shoemaking family in London and become an apprentice at 15. After fighting for the Army in WWI he joined Tuczec, a high society London shoemaker on Clifford Street, Mayfair. He remained there for 38 years before leaving in 1958 to start up his own business: G.J.Cleverley of Cork Street, Mayfair, London. 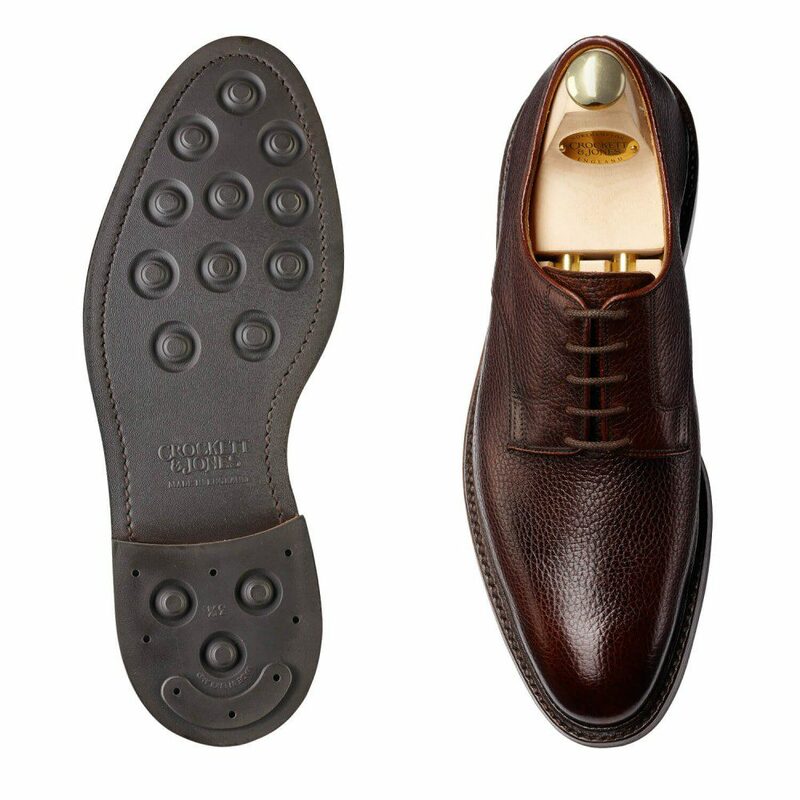 He was responsible for the ‘Cleverley shape’ – a graceful, chisel-toed shoe which became a signature of the brand. While Cleverley shoes are bespoke made in London, they do outsource the closing. And their ready-to-wear shoes are produced in Northampton (by a couple of the shoe manufacturers above, we won’t say who). 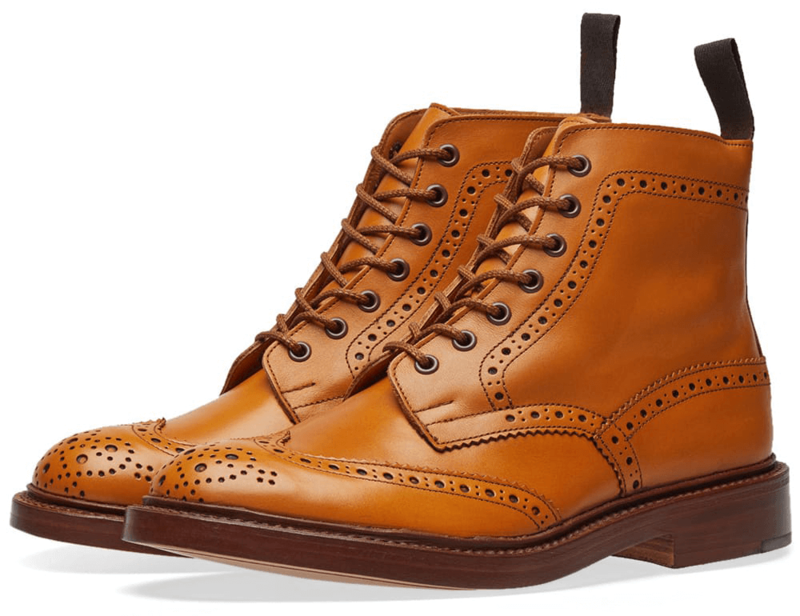 Aside from the aforementioned confusion surrounding which lines are produced in England and which in India, Grenson is still one of the finest and well-known footwear manufacturers in the world today. A trailblazer who continues to push the boundaries of shoemaking, the brand was the first manufacturer to use the now-renowned Goodyear-welting construction method, and in recent years has launched its ‘Triple Welt’ line: a collection of shoes conceptualised not by the design department, but by the artisans in the factory, designed to look like it has three welts of differing widths. John Lobb has been making shoes and boots for gentlemen since 1866 in London, and 1902 in Paris. 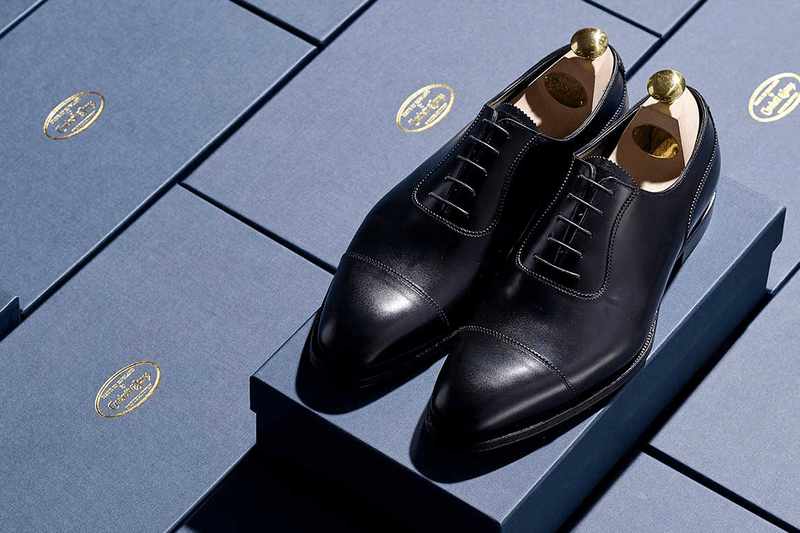 These days, the company continues to maintain its bespoke shoemaking tradition in the French capital, while also retaining core bespoke principles in the manufacture of its ever-expanding ready-to-wear collection of shoes and leather goods. The biggest shake up was in 1976 when John Lobb was acquired by the Hermès Group. However, the London bespoke workshop, John Lobb Ltd, remained in the hands of the family, and continues to operate independently from its premises at 9 St James’s Street. The Paris bespoke atelier, the By Request service and ready-to-wear collection, as well as all the other John Lobb boutiques, are all part of the Hermès-owned company. In 1994 John Lobb opened its Northampton workshop, where today the ready-to-wear line is designed and made by hand. All its shoes retain the timeless traditions of John Lobb: exceptional quality, fine craftsmanship, comfort, durability and elegance. The Loake family have been making traditional English shoes since John Loake opened the first Loake factory with his brothers, Thomas and William, back in 1880. Five generations and more than 130 years later, the Loake association with fine, handmade shoes lives on. 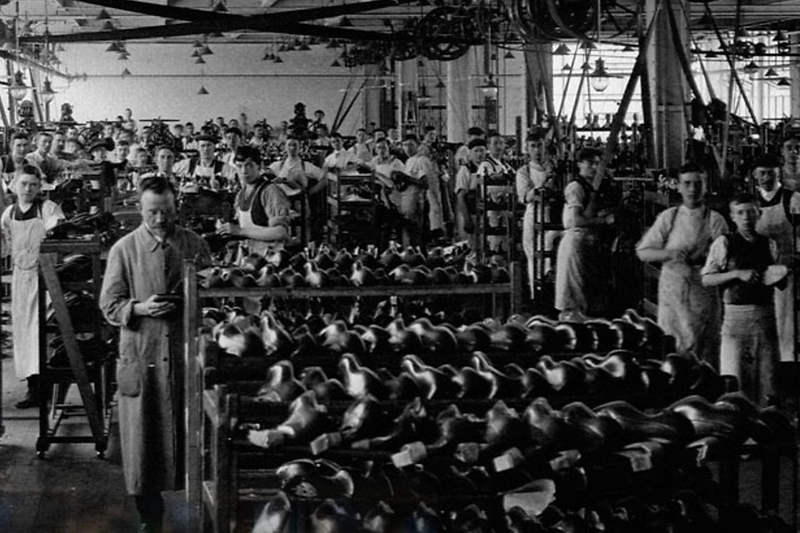 Loake premium-grade Goodyear-welted shoes continue to be made in Kettering, England, in the same factory that the three brothers built in 1894. However, alongside Loake’s English Goodyear-welted footwear the brand now design and produce a range of shoes outside the UK in India, using a variety of constructions. This enables them to offer a complete wardrobe of shoes at a more affordable price point. The quality is still there, we must say. Tricker’s is another monolith of a shoe brand and will win the player’s player award within the cobbling fraternity every year. From my short spell as a trainee tailor, my colleagues would always perk up at the mere mention of Tricker’s. Their Stow Biker boot with the high-shine Iris patina, in particular, was lasciviously worshipped by one work colleague. All footwear is 100% made in Northampton. George Cleverly only make their bespoke shoes in London, but outsourcing the closing. All of their ready-to-wear shoes are made in Northampton by a couple of the shoe manufacturers named above.